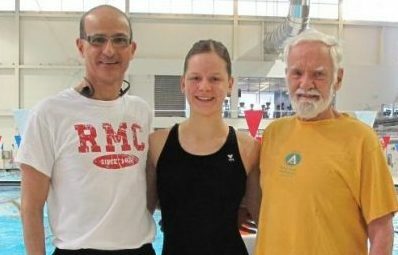 Feature photo caption: 3462 Chris Smith, 27182 Carmen Kiltz and kommy Farahani (Head Coach RMCC Swimming) at the Pan Am Pool, Markham 26 February. Canadian National Records (Chris), 1st and 3rd place finishes (Carmen) and 2 Personal Best times (kommy). Now that is our own 3462 Chris Smith, after suffering a serious heart attack in November 2014. An accomplished Competitive Swimmer at Royal Roads, he pondered his slowing swims between 2002 and 2012. Although he reminds us, gracefully, that his age group swimmers were slowing down even faster. For nearly a decade prior to 2002, he was full steam ahead with serious training and crafting faster times in the longer distances. Rather wistfully, he chimes in that his sprint distances were showing signs of slowing down. The ensuing quintuple bypass surgery at the Peter Munk Cardiac Centre did not relegate this steely resolved architect to the confines of an armchair athlete. 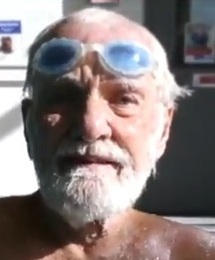 His gentle and warm presence, accentuated by Santa Claus white hair and beard, re-appeared only a short few months after his successful surgery in the Masters Swim Meets. He gleefully credits his accelerated recovery to decades of swimming regimen. At a very young age he took on swimming to mitigate his asthma condition, so it was in his DNA to train and compete seriously again to overcome the heart trauma. In 2017, he has shattered 38 Ontario and 12 Canadian National age-group Records. Two of these latter records were in 200 and 400 metre Free in Pan Am Pool in Markham on 26 February. Yet, his golden heart kicked in to an unprecedented gear in the Provincial Championships on 24 March in the same pool. In the course of setting a new Canadian record in 1500 metre Free, that is the metric mile, his 200 and 400 metre splits were faster than those individual events a few weeks earlier. His Everest-size humanity will be on display in the Swim Meets across the continent, and very soon he will be deploying his world-class breath to blow 85 candles on his birthday.